￼￼￼￼￼￼￼*All orders must be submitted to the Home Office from noon, CST, November 25 through noon, CST, December 1, 2015. Quantities may be limited and all items are subject to change. Join my Team in November and receive these bonus items! 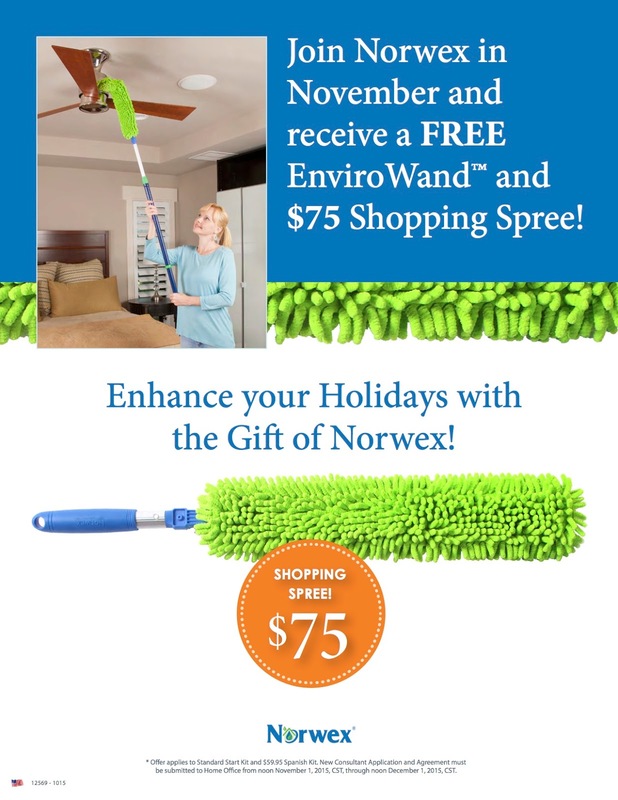 Enhance your Holidays with the Gift of Norwex! Join Norwex in November and receive a FREE EnviroWand™ and $75 Shopping Spree! 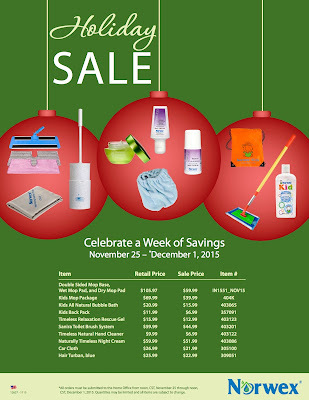 ￼* Offer applies to Standard Start Kit and $59.95 Spanish Kit. New Consultant Application and Agreement must be submitted to Home Office from noon November 1, 2015, CST, through noon December 1, 2015, CST. When you join my team and submit $250 in sales during November 2015, we will both receive a 2016 Norwex Day Planner*! ￼￼￼￼￼￼*New Consultant Application and Agreement must be submitted to Home Office from noon, November 1– noon, December 1, 2015, CST. 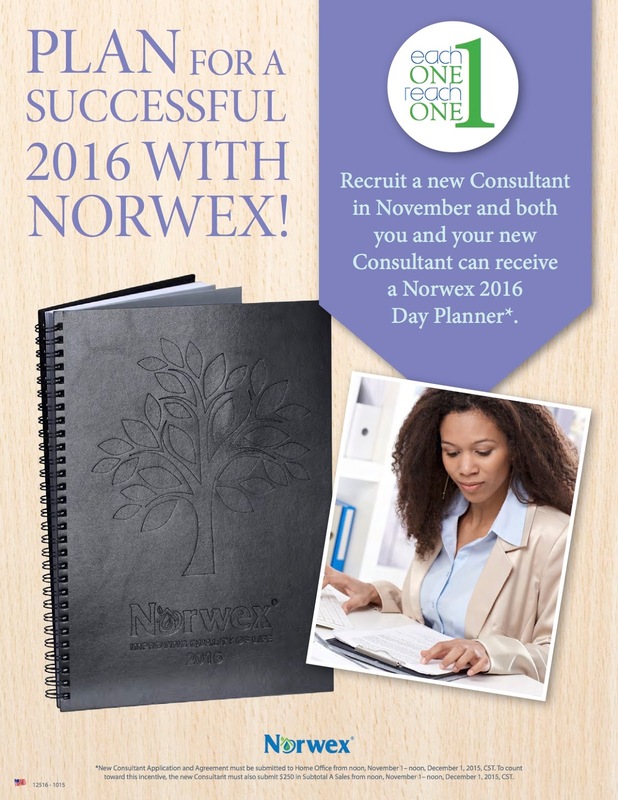 To count toward this incentive, the new Consultant must also submit $250 in Subtotal A Sales from noon, November 1– noon, December 1, 2015, CST. 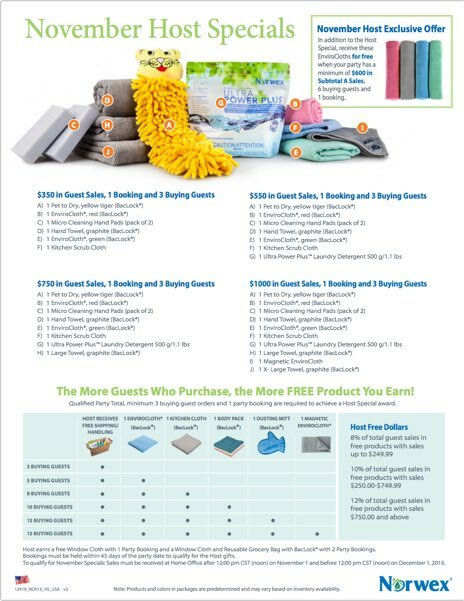 Get Big Cleaning at a Small Price! 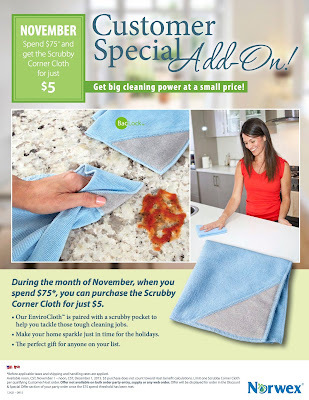 Spend $75* and you can purchase the Scrubby Corner Cloth for only $5! Our EnviroCloth™ is paired with a scrubby pocket to help you tackle those tough cleaning jobs. 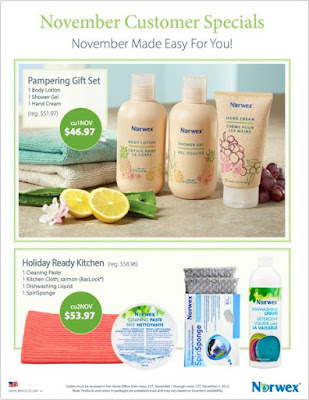 Make your home sparkle just in time for the holidays. *Before applicable taxes and shipping and handling rates are applied. Available noon, CST, November 1 – noon, CST, December 1, 2015. $5 purchase does not count toward Host benefit calculations. 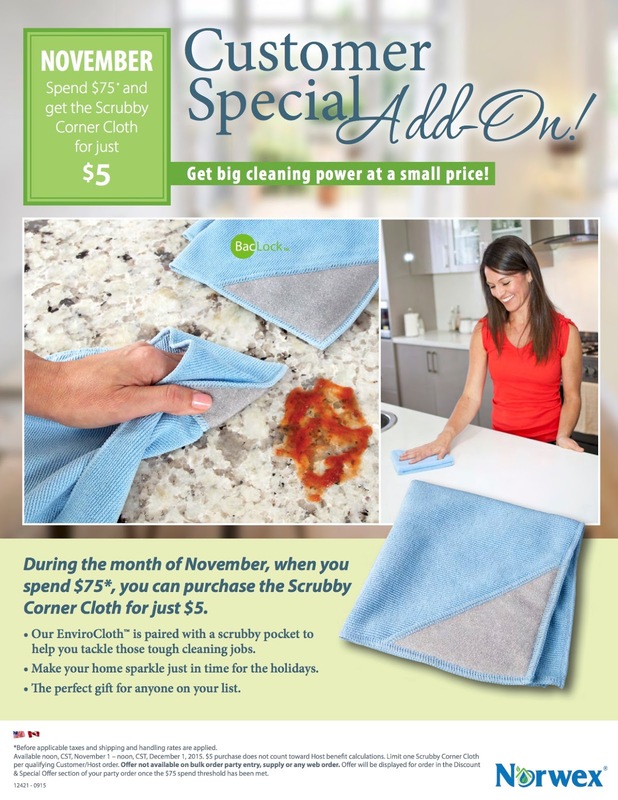 Limit one Scrubby Corner Cloth per qualifying Customer/Host order. Offer not available on bulk order party entry, supply or any web order. Offer will be displayed for order in the Discount & Special Offer section of your party order once the $75 spend threshold has been met. 6 buying guests and 1 booking. To qualify for November Specials: Sales must be received at Home Office after 12:00 pm CST (noon) on November 1 and before 12:00 pm CST (noon) on December 1, 2015.